German scientists have constructed a powerful new light system that can focus energy equivalent to the radiation of 10,000 suns onto a single spot. Eventually, they hope, this “artificial sun” could be used to produce environmentally-friendly fuels. The impressive light system is called Synlight, and it’s located in Juelich, about nine miles west of Cologne, Germany. 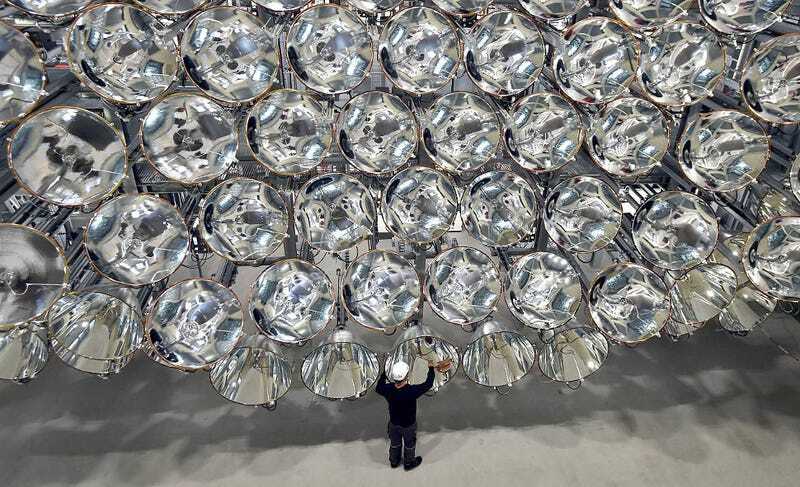 The German Aerospace Center (DLR) scientists who developed the system assembled an array of 149 xenon short-arc lamps—the same kind used in large cinema projectors—to reproduce and focus as much energy as would be received from 10,000 suns like our own here on Earth. During today’s launch, the researchers focused the 350-kilowatt honeycomb-shaped array onto a single 8x8 inch (20x20cm) metal sheet. DLR Director Bernhard Hoffschmidt says the system is capable of creating temperatures as high as 5,432 degrees Fahrenheit (3,000 degrees Celsius). The entire structure measures an impressive 45 feet (14 meters) high and 52 feet (16 meters) wide. So, why would anyone want to create such a hell-on-Earth scenario? The researchers are testing new ways of forcing elements to come into existence, namely hydrogen. Unlike many other fuels, hydrogen doesn’t produce carbon emissions when burned, so it doesn’t contribute to global warming. But hydrogen fuel doesn’t occur naturally on Earth, requiring stellar-like conditions to split water into its two components, hydrogen and oxygen—but you undoubtedly remembered that from chemistry class. When the array is focused onto a single spot, it heats metal to 1,475 degrees Fahrenheit (800 degrees Celsius), which is then sprayed with water vapor. The metal reacts with the oxygen in water, and hydrogen remains. With further heating, the oxygen is once again separated from the metal. Needless to say, no one can be inside the building when the lights are flipped on; a single second of exposure to the ambient radiation bouncing off the walls would fry a person. The other thing you may recall from chemistry class is that hydrogen is highly volatile. In its liquid state, hydrogen fuel is capable of combusting with just one-tenth the energy required to light-up gasoline. This fuel, once created, will have to be treated with extreme care. Eventually, however, hydrogen could be used to power cars and planes. Thankfully, measures can be taken to make hydrogen fuel safe, such as highly durable pressurized tanks that, if punctured, would instantly dissipate the stuff into the atmosphere. Alternately, carbon monoxide could be added to the mix, creating environmentally-friendly kerosene fuel that can be used in the aviation and rocket industry. A current limitation of Synlight is the amount of electricity it requires to operate. In just four hours, the system uses the same amount of electricity an average household consumes in an entire year. The researchers are obviously aware of this problem, and that a system requiring so much energy to produce clean fuel might not actually be all that environmentally friendly, but hope that a future version will run on solar power. In fact, the researchers say, an auxiliary goal of the Synlight system is creating more efficient solar panels that can actually produce enough energy to run that thing. The machine in still in the testing phase (the researchers expect “several years” of development), but once proof-of-concepts are achieved, the system could be ramped up to ten times its current size, making it suitable for industrial-scale tasks. A similar system is currently being tested by researchers from from the Swiss Federal Institute of Technology in Lausanne (EPFL). Their machine consists of 18 light sources arranged in a pair of concentric circles. The EPFL researchers are using it to study and develop new ways of converting and storing solar energy, testing solar power equipment, measuring heat transfer between materials, and analyzing materials under stressful conditions.